In history, it often takes several years to learn that some years have been very special, and others have been even more very special. In the world of gold and in its slipstream the other metals, 2012 has been special in the sense that sometimes it looked as if the bull market was coming to an end. The upward trend of gold that had continued over the decade 2002-2012, stagnated and came under severe pressure from heavy selling, not as much of real gold but instead of huge amounts of forward paper gold contracts from unknown and unidentifiable sources. Under influence of the financial and economic problems in many parts of the world –several European countries, Japan, the United States– several gold owners decided to sell parts of their holdings in order to secure profits before ‘it would be too late’. As is usual during every turn of the old into the new year, almost everybody comes to reminisce, evaluate, look ahead and above all, make new plans to cut the old bad habits and develop the new good ones. So do all the commentators in the world of investments and of course, also those who focus on gold, other metals and the resource industry. I notice that recently, the previews and foresights have been pretty careful with making concrete predictions of the gold price. Not so surprising because the recent market performance of gold and in particular of the resource stocks, have dampened the prevailing enthusiasm. As it always does. The commentators and especially the self-appointed ones and those who came to the sector to join the opportunism of a strong market, get wet feet as soon as they suspect a drop of water or feel that the ship of gold may sink. For those of you who want to have quality guidance and insights from the best analysts and commentators around, there are too many articles to mention. Just roam the best possible websites such as The Gold Report, GoldSilverWorlds, Free Gold Money Report, Sprott Asset Management and several others. Doug Casey: “The Morality of Money” at www.caseyresearch.com . As for myself, I just would like to save you from any long observations, evaluations and predictions. 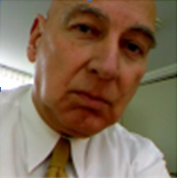 From reading my regular editorials, you know that I still maintain my long-term view and continue to look at a continuation of the upward trend for gold and the other precious metals silver, platinum and palladium. Also, my view on resource stocks is still the same: they become more attractive every day, they are grossly undervalued and misunderstood. They are due to bounce back, especially those that are reporting good results from their production activities and exploration programs. The bottom line of my thoughts about gold is that, despite how the recent and current markets are annoying us, I still feel that gold is not expensive as so many ‘know-it-all’s want us to believe. I have said it before and say it again: the historic high gold price dates from January 1980 when it reached $850 per ounce. Applying a generally accepted correction method based on factors as inflation, cost of living development, that $850 of 1980 would equal a price of approximately $2450 per ounce in dollars of today. So anyone that tells you that gold is expensive, too high or at record levels, has no sense for historic development and reality. Gold remains to be the only asset without any liability and every portfolio should deserve a holding in some gold or gold-related investments. The above reflects my primary wish for the newly started and fresh new year 2013: a return to common sense as to the position and value of gold and also, contradictory to the theory that the renewed printing of paper money eventually should be good for gold, that the same common sense may return to the world leaders and their chiefs at the Central Banks. But, in the habit to make many wishes at the beginning of every new year, I have quite a few other wishes and good intentions. Before I give you a rundown of them, I want to say a few words about the new look. I have decided to start implementing a new house style for the European Gold Centre and its reports as you will have noticed when you opened the link to this January issue of GOLDVIEW. The new look symbolizes a fresh beginning of my writing in the second decade since I returned to the world of gold in 2002. Another step is to complete the new website sometime in Q1, with the same new look and more possibilities to be actually commenting on the general developments in the gold, other metals and mining markets, on the mining and exploration developments of the Supporting Companies, on international mining (finance) events and other interesting news. In short, anything that I would like you to read and to know about. Let me share with you some of the wishes I made and intentions I have but before that I like to mention, for a good understanding, that where I talk about gold, I also mean to include the other precious metals, silver, platinum and palladium and other metals and minerals that I cover. I wish that we will have year in which the markets for gold and resource stocks will develop as I (and with me, a strong and highly regarded group of evenly focused and directed minds) think they should and deserve to. Gold should continue its path of the last ten years, simply because its unique character as a valuable asset is generally still not sufficiently recognized by investors. Their blind faith in the regular stock markets is just not justified by the prospects of the financial and economic situation in the world. As gold is still relatively cheap and circumstances support a continuation of the long term bull market, I have a very strong belief in seeing solidly higher price levels in the future. I wish that investors will come to see and understand that the undervaluation of mining and exploration shares has reached a level that makes them utterly attractive and prospective for a well-deserved recovery. I reiterate what I wrote in previous issues, that the main attraction of resource stocks is not because of the higher gold prices that I foresee. The current prices are already at a level that producing companies can operate successfully and profitably, enjoying proceeds that enable them to finance and/or obtain financing for their growth and expansion. The current price levels also make it worth for exploration companies to continue to look for the metals although the current state of the financial markets is making it more difficult for them to raise the necessary funds. Yet, several exploration companies that have made significant discoveries and/or have been reporting good progress at their projects are proving that investors with confidence can still be found. I wish that the Supporting Companies, the companies that I follow very closely and make it possible for me to report their developments to you, will continue to accomplish the goals they have set. Most of them have a good story to tell and have proven that their capable management teams are steering their company into the right direction. I am confident that they will continue their progress as planned and that they will not only live up to the expectations they have for the new year but will also report some very pleasant surprises for their shareholders in 2013. I wish that ARGONAUT GOLD (TSX:AR) will be able to make further progress on the way to attain their ambitious production target of 300,000 to 500,000 ounces in the next few years. The existing and expanding El Castillo and La Colorada mines will be getting company in Mexico from the advanced San Antonio project and the recently acquired Magino mine in Ontario. Just at the end of 2012, Argonaut strengthened its financial position through the exercise of warrants which brought $115 million to the treasury. I wish that AURCANA (TSXV:AUN) will succeed in realizing its amazing expansion targets for its silver production at the Shafter mine in Texas, USA and the La Negra mine in Mexico. The Shafter has been operating a test program but reached commercial production last December. As mining operations proceed, the capacity is scheduled to increase from the current 600tpd to 1,500tpd. The La Negra will see its capacity growing from the current 2,500tpd to 3,000tpd by the end of Q1. I wish that AVINO SILVER & GOLD MINES (TSXV,NYSE MKT:ASM) will successfully develop into the significant silver producer it once was. At its Gonzalo mine, full-time production was achieved in last October. Re-opening the original Avino mine, one of the oldest silver mines in Mexico with a history that goes back 500 (!) years, will be the vital part of Avino’s expansion plans. Dewatering is in progress and the re-processing of the oxide tailings from previous operations is being prepared to start up in early 2015. I wish that BRALORNE GOLD MINES (TSXV:BPM) will succeed to establish on-going gold production at its re-opened Bralorne mine in BC, Canada. In the past, 4 million ounces of gold were produced from the Bralorne, King and Pioneer mines. The company worked hard to complete its Preliminary Economic Assessment. Surface drilling in the gap area between the Bralorne and Pioneer properties identified two new gold bearing structures and an impressive intersection of 409.5g/t gold over 1.2m was found. I wish that GREAT PANTHER SILVER (TSX:GPR,NYSE MKT:GPL) will sustain their record of steadily growing silver and gold production and revenues. The company target is to eventually reach 5+ million ounces silver equivalent production level. The two 100% owned mines in Mexico, the Guanajuato and the Topia, are expected to have produced appr. 2.2 million oz ag eq in 2012. Great Panther deserves to be the proper example of the idea that silver producers should outperform the metal itself due to leverage. I wish that NEW DAWN MINING (TSX:ND), as significant gold producer in Zimbabwe, will be able to find an answer to the pressures in operations and cost of production which turned their financial plus of 2011 into a minus in 2012 despite higher revenues from the 37,623 ounces of gold production from 5 operating mines. Knowing management, they will be on top of the developments. Given the foreseen recovery potential of the country as a gold producer, New Dawn is likely to maintain and strengthen its leading position. I wish that ORVANA MINERALS (TSX:ORV) will continue its pattern of production and earnings as it just reported from its first full year (as per Sep 30, 2012) of commercial operations at the EVBC mine in northern Spain and nine months of commercial operations at the UMZ mine in Bolivia. Combined production came to 55,929 ounces of gold, 15.4 million pounds of copper, 716,280 ounces of silver and 636,126 pounds of lead. For fiscal 2013, 75,000 ounces gold, 18 mio pounds of copper and 850,000 ounces silver are targeted. I wish that SCORPIO GOLD (TSXV:SGN) continues its dedicated progress at the 70% owned Mineral Ridge mine in Nevada, USA. Commercial production was achieved by January 1, 2012 after a pre-production working stage since February 2011. 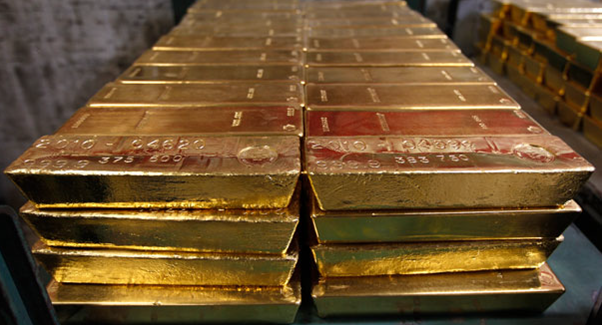 Gold production for the just ended 2012 is forecast at 32,000 to 35,000 ounces. 2013 will be a year of expanding the existing mine and developing the newly acquired Goldwedge and Pinon properties, also in Nevada. Scorpio aims to be a mid-tier gold producer within 3 years. 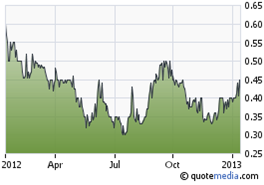 I wish that SILVERCREST MINES (TSXV:SVL,NYSE MKT:SVLC) will enjoy the same exciting development as it has had so far. At its Santa Elena mine in Mexico, production over the first 9 months of 2012 reached 425,748 ounces of silver and 25,173 ounces of gold, together equal to 1,782,808 silver equivalent ounces. For the full year, this figure is expected to come to 2.2 mio ounces. But there is a lot more to tell, such as the low cost of production and the impressive expansion potential. Soon, my Company Report will do just that. I wish that TIMMINS GOLD (TSX:TMM,NYSE MKT:TGD) will keep impressing their shareholders with good progress at its San Francisco mine in Mexico, both as to gold production, significantly increasing reserves and resources and reporting record profits from operations. The open pit heap leach operations are scheduled to produce gold in excess of 100,000 ounces annually. Moreover, there is substantial upward potential with the recent discovery of a new mineralized zone only 1km from the San Francisco pit. And there is more to come. From the above brief profiles, you may see that there is no reason to be concerned about the developments in the gold and silver mining industry. Most of the established producers from the big league are doing well, as I judged from their presentations last year in Denver, and the in my opinion more interesting emerging producers, to which the above Supporting Companies belong, have even more exciting prospects. They are looking ahead at growth of production and increasing their resource base, either through intensive exploration drilling and/or from newly acquired projects. I wish that PARAMOUNT GOLD & SILVER (TSX,NYSE MKT:PZG) will take the next vital steps to bring the company closer to the status of a gold and silver producer. The two key projects, the Sleeper Gold project in Nevada, USA and the San Miguel project in Mexico, each have the potential to succeed. Both have robust established resources and drilling is continuing successfully and expanding the mineral zones. CEO Chris Crupi has impressed me with his driving and determined management style. He will make it happen. I wish that CORAL GOLD RESOURCES (TSXV:CLH) will be able to further advance its main project, the advanced stage exploration Robertson property in north-central Nevada, USA. Over the last 20 years, Coral has spent more than $25 million exploring its claims which led to the discovery of 5 mineralized zones. The company is currently awaiting the official word from environmental authorities for submitting a new Plan of Operation which calls for up to 500 holes of new drilling. I wish that CANASIL RESOURCES (TSXV:CLZ) will establish the recognition it deserves from some strong potential joint venture partners to move several of its attractive exploration projects forward. CEO Bahman Yamini has built a portfolio of 100% owned projects in Mexico and BC, Canada including 7 drill ready properties with potential to host very large silver, gold and base metal mineralized systems. The La Esperanza project is currently being worked on by partner MAG Silver, others are waiting to be tapped. I wish that AVRUPA MINERALS (TSXV:AVU) will become known in wider circles of international investors as it is having interesting exploration projects in Portugal, Kosovo and believe it or not, Germany. The main focus is on Portugal with exploration for copper, zinc and gold in the south and for tungsten, gold, bismuth and tellurium in the north. Fascinating is the project in Germany where Avrupa is looking for gold in the historic Erzgebirge mining district, a 1000-year producer of tin, tungsten, silver and base metals. I wish that CUORO RESOURCES (TSXV:CUA), headed by a new management team, will be proven right with its decision to focus on the high-grade drill results at its Santa Elena copper-gold project in the Antioquia district of Colombia. The 23,500m of drilling has so far resulted in the discovery of two ore-bearing lenses, possibly part of a much larger VMS system. The continuous drilling aims to identify additional massive sulphide lenses that would make the Santa Elena an economically viable high-grade copper project. I wish that EXPLOR RESOURCES (TSXV:EXS) will continue to make good progress at its flagship Timmins Porcupine West project in the Porcupine mining camp of Ontario, Canada. As a pure explorer, the objective is to expand the already established mineral resource, currently standing at 212,800 Indicated ounces of gold and 814,800 Inferred ounces of gold. CEO Chris Dupont has set the target to increase the resource to 3.0 million ounces of gold by the end of 2013. A great achievement to look forward to. I wish that TEMBO GOLD (TSXV:TEM) will achieve drill results in 2013 with the same grades and widths as reported last year from its Tembo Gold project, adjacent to African Barrick’s 14moz Bulyanhulu mine in Tanzania. Encountering 9.38g/t over 6.30m, 10.76g/t over 4.00m, 8.17g/t over 11.05m, 16.10g/t over 3.00m and 10.17g/t over 6.00m are worth writing home about. Drilling has resulted in defining a mineralized strike length of over 1,600m in two main project areas. I think CEO David Scott will continue to please us. I wish that LOMIKO METALS (TSXV:LMR) will show that graphite is indeed ‘the newest gold’ as many of the comments in 2012 on this emerging new en-vogue mineralization want us to believe. From the newest ‘rush’ of all the graphite and graphene companies, I find Lomiko having a very convincing story. Its Quatre Milles Graphite property in Quebec, Canada is a quality property with historical graphite exploration. The just recently reported drill results of the Phase I exploration program have been highly encouraging. I wish that all the above companies will continue to enable me to keep you informed on their corporate and project developments. Without their assistance and support, I would not be able to maintain the facilities that are necessary to create and publish my reports and get them to you via the website, other channels and the more and more important stimulative notifications via the social media. Also my frequent presence at international mining and mining finance conferences and other events is of vital importance to meet international resource companies, members of the European and other institutional financial and investment communities as well as investors that have joined my ever-growing worldwide audience. I wish that I will have the health and strength –there will be no lack of inspiration– to do my writing: my monthly issues of GOLDVIEW will continue to be the main expression of my views and opinions as to the gold and resource markets in general. I am happy to say that I have several intentions and plans for the coming year, the issues of MINING IN AFRICA, MINING IN EUROPE and MINING IN MEXICO and the newly to be added MINING IN COLOMBIA will each be coming out 4 to 6 times a year and if necessary and possible, more frequently, my COMPANY REPORTS will be appearing throughout the year, to be followed by my UPDATE REPORTS, new will be a series of SPECIAL REPORTS in which I will focus on specific countries and regions that have my specific interest. These can be areas where mining and exploration developments have been of special importance, or that I have covered in the past and where developments would justify an updated vision, as I have been getting more experience with the social media, I will continue and expand using these new paths of communication. I will give my brief comments on sites like Facebook, Twitter and LinkedIn where also new reports are being announced. I will further use these media to relay the announcements of news that the Supporting Companies release. I wish that I will be able to expand and strengthen the group of companies that are supporting my efforts. During my visits to several mining events in the course of last year, I have met so many companies that I used to know, that I had followed from some distance and/or that I didn’t really know about. In some issues of GOLDVIEW and MINING IN AFRICA of the last few months, I have included several of my impressions and their names. Not surprisingly, they were mainly from Canada but there were also some from the United States, Australia, African and Europe. I would like to have some of them to write about and introduce them to you. A few years ago, I decided not to concentrate only on Canadian-based and –listed companies as I have been doing from 1983-1992 and since 2002 again. About two years ago, I opened the door for non-Canadian ones because, in light of the continuous good climate for gold and gold stocks, I deemed it of importance that my network of resource minded European institutions and my worldwide private and professional audience would be able to read about mining and exploration companies and projects, based and listed in other parts of the world. Despite my efforts to interest Australian and ASX-listed, UK and LSE/AIM-listed, and African JSE, BSE-listed companies in joining and benefitting from coverage in my reports and personal appearances, I did not succeed to get even one. To my surprise and regret, I would like to add. Australia, Africa and Europe were presenting. I had many interesting meetings which resulted in convincing some significant emerging producers and promising exploration companies that my reports are a well-regarded tool to acquaint a high quality audience with them, such as Aurcana, Argonaut Gold, SilverCrest Mines, Avrupa Minerals, CuOro Resources, Tembo Gold, Lomiko Metals, Explor Resources and Orvana Minerals, and re-establish the relationships with former clients Avino, Coral and Bralorne. All Canadian-based and listed. Apart from that, I connected with several interesting other companies from Canada which I am now following more closely than before. In this respect, I mention old favourites and friends like Silvercorp, Semafo, MAG Silver, International Northair, Kimber Resources, Brigus Gold, Endeavour Mining (they acquired Etruscan Resources), GoldQuest and new ones like Batero Gold, Golden Predator, Montero Mining, Stockport Exploration, Torex Gold, Sunward Resources, Revolution Resources, Riverside Resources, Columbus Gold, Edgewater Exploration, Aureus Mining, Brigus Gold, Centamin, Gold Resource, Mandalay Resources, Oromin Explorations, Pacific Wildcat, Richmont Mines, Avala Resources, Thor Explorations, Global Minerals (see later in this issue), Dalradian Resources. And indeed from Australia, GoldRoad Resources, Indochine Mining, CGA Mining, Focus Minerals, Cerro Resources, Teranga Gold, Bassari Resources, Base Resources, and from Europe EurOmax Resources, Nordgold, Goldplat, Red Rock Resources, African Consolidated Resources, Randgold Resources. All these companies are now on my radar screen that contains many others already. I would not be surprised if several of them will come to a commitment to be covered in my reports. Not bad for a new year’s wish, is it? I wish for what I extensively discussed in my last issue of 2012, that I wish we will get some vital answers to the question if all the gold that we think is safely stored in Fort Knox and the Federal Reserve New York is indeed there. I do mean real answers, clear, concise and specific. Political statement that it is not in the general interest to disclose the necessary information and agreements like the one that calls for the return of German gold by the Fed over 30 years is not what we are waiting for. If 25,000 people electronically sign the petition, the White House is obliged to forward it to policy experts for review and to make a public statement about it. To my readers in the US I would like to say: if you agree that an answer is desirable and necessary to clear this issue, once and for all, I call for your attention and consideration to sign the petition. It can be found at: Perform an assayed public audit of all the Treasury’s claimed 8,100 tons of gold and net of swaps, loans & sales. My final wish for this issue is that all of you, my highly valued international audience, will continue to follow these developments and my editorials on the fascinating and exciting markets of gold, other metals and international mining and exploration companies. During the last 10 years, I have been positive about the growing attractiveness of gold as a basic investment and judging from the price chart on the next page, that was rightfully so and very well-timed. I am confident that also in 2013 and beyond, I can keep myself busy with writing about the successful performance of gold and other remarkable subjects of interest and value. The past year showed a very satisfying expansion of my audience, in quality, quantity and geographic coverage. I wish for a continuation thereof. As this chart so nicely illustrates, we had 10 very good years for gold, despite the hesitation in its pretty glorious performance that we have experienced since the first half of 2011. I have included this chart in some of the presentations that I have recently made. Many people reacted to this chart by saying that they have not really been aware of the fact that gold had moved up for so long and in such quite a straight line. Most probably the reason for that is that most of those people have not been following the price of gold all that time. 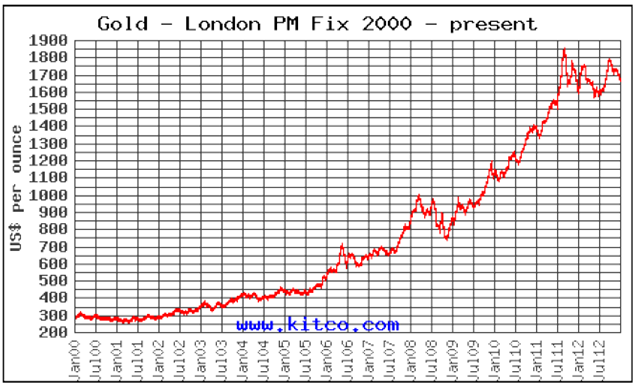 The real interest in the precious yellow metal has really started growing over the last few years. Yet, as mentioned so often, only a mere 2% of all the invested money worldwide, is invested in assets that are related to mining and exploration. Looking forward often begins by looking back. Back to December 2011, only just over 1 year ago, the heading of my GOLDVIEW issue was “$10,000 GOLD, A MYTH OR A DISTINCT POSSIBILITY”, still on my website, in which I elaborated on two remarkable predictions made by James Turk, one of the most widely respected analysts and commentators on investing in gold, and Shayne McGuire whose road to fame was paved by his decision in 2008 to invest part of the then $115 billion Teacher Retirement System in gold. Shayne’s case for $10,000 gold was not really a prediction but what he said was that IF other pension funds would invest only a small percentage of their portfolios in gold, such still unthinkable price could be a possibility. Going back to the aforementioned 2% of all invested money in gold- and resource-related assets, and with a wink to Shayne McGuire, I would like to say that IF the growing interest in these assets would lead to an increase of 2% to 5% of all investment money in the metals and mining sector, I would be very curious to see what the gold price would be then coming to. To be clear, this is not a wish, it is a thought, a thought that could be a possibility too……..
“Global” in the name of Global Minerals Ltd. should not be explained as “having presence everywhere in the world” but rather as “going everywhere in the world to find and build a successful mine”. In this case a silver mine in SLOVAKIA, in the Heart of Europe. When you want to read about mining in this country, you enter a history that dates back to the Celts in the 3rd century BC. For the history of Global Minerals you don’t have to go back that far, the 100% ownership of the Strieborná silver deposit was acquired in 2006. The deposit was part of the Maria copper mine, situated in the old mining fields of Rožňava where mining came to an end in 1992 with the decommissioning of the Maria mine. The 2008 NI 43-101 compliant resource shows 14.3 million contained ounces of silver and 48.1 million pounds of copper in the measured and indicated categories plus an additional 13.5 million silver ounces and 29.8 million pounds of copper in the inferred category. In addition, there are significant quantities of antimony (29.2 million pounds measured and indicated plus 19.8 million pounds inferred) which could provide an important by-product credit. Recent test works demonstrated that a conventional low cost flotation process will yield a high grade silver/copper concentrate with as much as 5423g/t silver, 22% copper, 0.72% mercury and 15% antimony. Recoveries can come to 96% of the silver and 97% of the copper. CEO William Pincus and his team are dedicated to bring the Strieborná back into production. In 2012, a water treatment plant was installed, pre-mine redevelopment started with dewatering and refurbishing of the mine to the working levels, metallurgical testing was completed, underground drilling is about to begin and the mine permit was awarded. For 2013 the program includes continuing the drilling, completing a Preliminary Economic Assesment and a feasibility study and starting development. Completion of development and start of production is scheduled for 2014. The three known veins parallel to the existing deposit indicate that there is good potential to substantially increase the resource. One of the veins intersected 667g/t, 5.1% copper and 3.4% antimony over 2.2m. Also the known Maria I vein with a historical assay from 126 to 1480g/t silver in widths of up to 3.2m and the Maria II vein could add considerably to the future resources. A silver mine in Slovakia may be difficult to comprehend for international investors. But for me as a European it is quite different. Knowing what is currently happening with resurging mining and exploration activities all over Europe, it is just exciting to know that there is a good chance to have a silver mine producing in the heart of our continent. Bill Pincus has known the project since the mid-1990’s and knows that the Strieborná has a striking geologic similarity to the silver bearing vein deposits of the famous Coeur d’Alene mining district in Idaho, USA. He has recognized the potential to re-establish the production and the potential for expansion of the resources in the future. An additional advantage is that the complex as part of a former operating mine has significant surface and underground infrastructure which would cost many tens of millions of dollars to install today. I am very pleased to have Global Minerals as a Supporting Company and thus, being able to bring the interesting developments at the Strieborná silver mine to you over the next 12 months. Mining and exploration companies with projects in Europe are still not sufficiently understood and hence, too often neglected by investors in other parts of the world. As the last phases of the mine development progress and actual production comes in sight, it is highly likely that the markets will recognize that a higher valuation would be justified. Just before deciding on how to close off this issue, the flow of daily information reports brings a heart-warming comment from a prestigious and worthwhile source. The Globe and Mail, Canada’s largest newspaper gives “up-to-the-minute insights on developing market news” in its Inside the Market section. Today, under the heading “Gold stocks to surge as much as 90% this year” John Hathaway, portfolio manager at New York-based Tocqueville gold fund says: “Gold will surge to new highs this year, a push upward that will cause a big rally in the depressed shares of precious metals miners.” In his view, this might get pretty stupendous for gold miners. He believes that when gold starts to trade sustainably above the US$2,000 an ounce level, shares could run up by 60 to 90%. I must admit, sometimes it makes me feel good that I am not the only one with confidence in a higher price level for gold, other metals and the shares of international mining companies. I am only human.